I’ve noticed many of you (with blogs that I read… drop me a comment if you’ve been lurking and we haven’t connected yet) have mentioned starting up your own backyard produce farms and/or gardens, so I thought I’d pass along some great tips from yesterday’s Toxic Free NC Spring 2009 email newsletter. Here are a few tips for starting a new garden from Toxic Free NC and Tom Mekus, owner of Native Elements Landscaping in Raleigh. Keeping your garden within a hose’s length of an outdoor tap is always a good idea, but it’s also wise to consider installing a rain barrel. Just one-quarter inch of rain onto a 300-square-foot section of roof can yield nearly 50 gallons of water! 919-715-6500I thought I’d just pass along some tips that were maintenance related, since many of you have already started (and posted) some of your great results. Be sure to read the full post for some even better all-around tips. 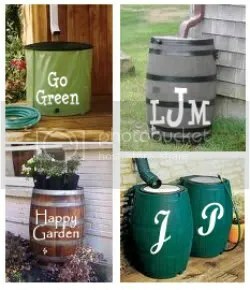 Want to make your own rain barrel? That’s definitely something I’m going to be tackling this summer… especially after previous summer droughts here in central NC.